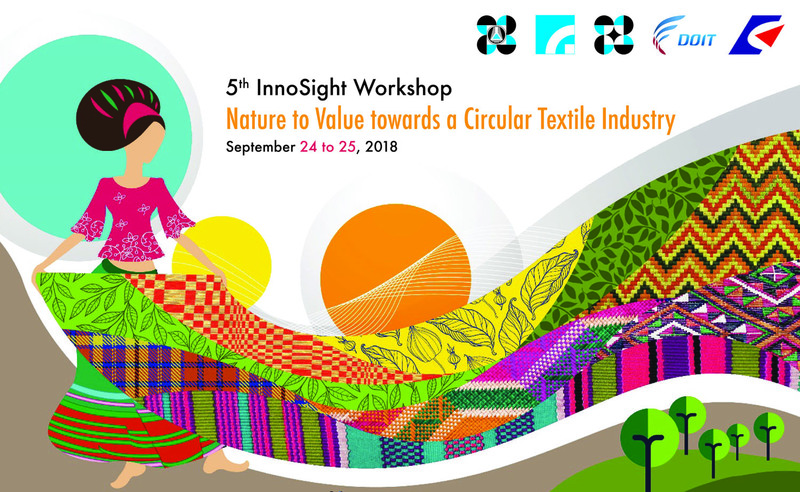 DOST-PHILIPPINE TEXTILE RESEARCH INSTITUTE TO CO-ORGANIZE THE 5TH INNOSIGHT INTERNATIONAL CONFERENCE / WORKSHOP ON "NATURE TO VALUE TOWARDS A CIRCULAR TEXTILE INDUSTRY"
After the successful forum hosted by DOST-PTRI on "Waste = Resource to Inclusive Circular Economy" last July 19-20, 2018, the Institute has the privilege to co-organize the 5th InnoSight Workshop in partnership with the Industrial Technology Research Institute (ITRI) of Taiwan. The conference / workshop will be held on September 24-25, 2018 at the Sofitel Philippine Plaza Manila in Pasay City. It aims to build an Asia-Pacific Circular Economy (ACE) Stakeholder Platform focused on sustainability for the textile industry. The two-day event will feature a host of notable international speakers led by Dr. Reiner Hengstmann, Go4More Global CEO and co-founder of the Sustainable Textile School, and Dr. Guang-Way Jang, Program Director of the EU Framework of ITRI. They will be joined by Philippine-based traditional textile businesses and social enterprises represented by Hannah Thiessen of A Beautiful Refuge; Daniel Lumain of Akaba; Anya Lim of Anthill Textile Gallery; Miag-ao, Iloilo's Handloom Weavers Association President, Anthony Selorio; and Lucia Catanes of Narda's Handwoven Arts and Crafts. Thailand's Amarpol Huvanandana of More Loop, Kamin Pongsarojanavit of Thai Num Choke, and Jumnong Nawasmittawong of the Association of Thai Textile Bleaching, Dyeing, Printing and Finishing Industries will join Taiwan's Yuma Taru of Lihang Studio; Laos' Mulberries and Phaeng Mai Gallery; Myanmar's Phyu Ei Thein of Sunflower Art, Organic Dye Textile and Crafts; and Vietnam's Dir. Nguyen Bao Thoa of the Rural Industries Development Institute. Co-organizers DOST-PTRI Dir. Celia B. Elumba and ITRI's Dr. Chang-Jung Chang will present institutional responses to technological barriers to value creation along with Dr. Chin-chuh Kao of Everest, and Dr. Yang-Ping Shih of the Taiwan Textile Research Institute. Ramon Magsaysay Awardee, Madame Komally Chantavong, with Boby Vosinthavong of Lao PDR, meanwhile, will share their development journey in mulberries. Day two of the 5th InnoSight Workshop will feature Net-works, through its Executive Director Amado Blanco, in partnership with the Zoological Society of London (ZSL), on the retrieval and recycling of nylon fishing nets from the Danajon Bank into new materials for carpeting and textile applications that are now finding its way back to Asia and the Philippines. Plenary sessions will share cases involving environmental sustainability and circular economy using conventional textile methods, breaking down of technical barriers and exploring new solutions, and defining niche markets through the sharing of best practices. These sessions will put focus on roles that the government, policies, businesses, science, modern technology, and innovation play in relation to textile industry towards the notion of circular economy and how to move forward with our current condition. The incessant effects of textile and apparel industry, from its processes, production, and consumption have been vilified especially with the hype of the fast fashion industry. The industry is known to be the second principal source of pollution in the planet, with textile dyeing contributing largely to water pollution. The impact generated from various sources will continually lead to health hazards and serious environmental degradation. As the research and development arm of DOST in textiles and allied industries, the DOST-PTRI promotes the circular economy approach by means of the "Cradle to Cradle" design concept of the book of the same title co-authored by Dr. Michael Braungart. Increased level of awareness that will lead to a change in mindset on our consumption and production processes is the intent with the co-organization of the 5th InnoSight Workshop. Collaborating with the right people behind one goal will move us forward towards the establishment of a convergence team for an Asia-Pacific Circular Economy Stakeholder Platform focused on textile.